Catsablanca - A German Shepherd - Kitty Love Affair. There he was 8 pounds of furry clumbsiness, mom had bought a dog, not just any dog... a german shepherd dog. I've seen there kind on the black and white TV. They chased down the bad guys on "cops"
Sure I could see her reasoning, there was a certain diamond in the rough charm about him... even if he was a dog. And if that wasn't bad enough he wanted me to play back. Well it was a good thing moms timing was so impeccable, a little voice inside me was almost wanting to break my swave gentlemen like stature just to wrestle the new kid. By now my tail was matted with dog drool and I had begun to feel like a real wild man myself. I was starting to like this side of myself, pretty far from the fancy feast way of life now I had started some banter back now with the dog called "Ulrich." It seems the kid really wasn't such a bad guy, after all if he could go toe to toe with this alley cat he can't be too bad off huh? The dusty evening had now turned into a cool breezy night. Mom had just put the kettle on and settled down in her favourite chair I took my place on her lap as usual. I tried sneaking some of her lady gray and that's when I saw him... all lonely and cute looking asleep at her feet. But for now I didn't care I just curled back up and went to sleep, after all the new kid was kind of comfy. Comments for Catsablanca - A German Shepherd - Kitty Love Affair. 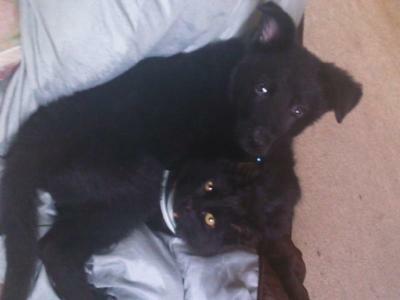 Thanks :) they are good they just wrestle alot not and hes so big now at 10 weeks old!!!!! That was a great story. Enjoyed reading it and how you presented the meeting. Best Wishes to you and Ulrich.